The traditional patting is to strike a ball by the "intuition" based on many many experiences. It's serious matter for a beginner by spending time and money to master the intuition. DMMP technology is developed in order to ease a beginner's above-mentioned burden. Since the putting becomes to be stabilized in slight practice, the pleasure of golf doubles. 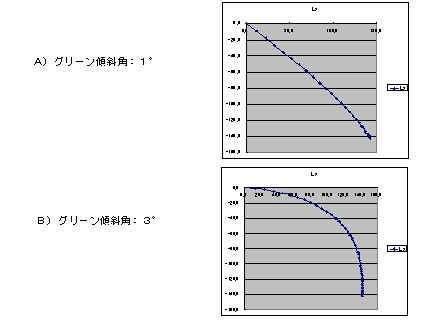 the DMMP effects are caused by not only the beginner class but also the expert class. In Olympic Game, almost all players will use DMMP, I hope. First of all, please watch the following short movie that　explains how to use DMMP. International Patent Application is registered at WIPO. If you want to try this new concept putter directly, please send us an e-mail. You need not hesitate. We have accepted many proposals already. Of course, you can buy our DMMP-Grips directly from this site. 1. The putting swing form is made by the pendulum type which consists of two arms and putter. 2. 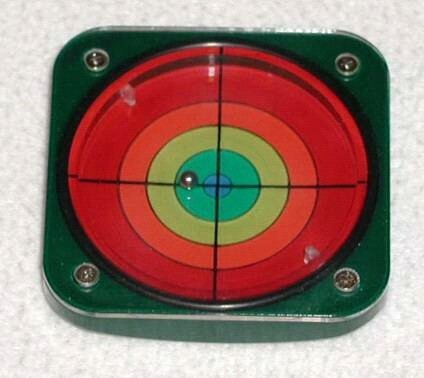 With this putter, the amount of backswing, which have a ball roll into a cup, can be measured. 3. With the sweet spot of the head, putt the ball by the measured amount of backswing correctly. The center of both shoulders, i.e., the base of a head, becomes the rotation center of the Pendulum. The grip forces are very weak but enough not to drop the putter. and to synchronize to the motion of the putter. The ball is hit by a head swing speed caused by a backswings amount, and is not hit by a muscular strength. 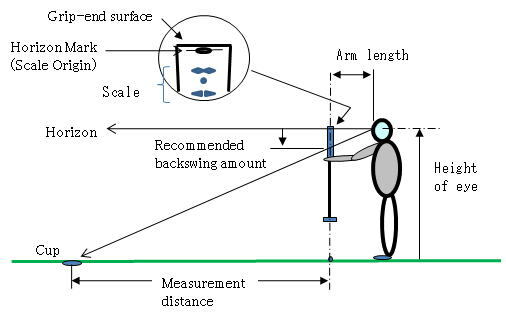 The cycle of a pendulum is decided by the length from an axis of rotation to a putter head. number of beats sounded by a metronome. 2. 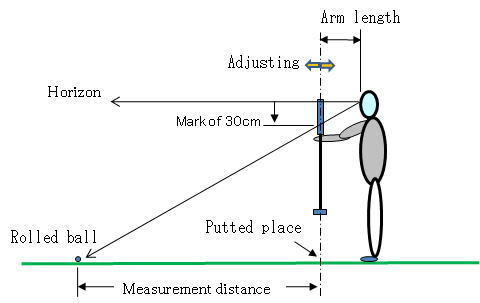 How to use "putter with a distance measurement mechanism"
(1) The amount of backswing which needs to roll a ball to a cup can be read in an instant. (2) In a few time before a putt, the player can concentrate on reading a green inclination and a line. (3) The player does not feel fear in front of a shot, because there is a reason of numerical decision. Even if it makes a mistake, this decision will be modified more accurately in the next putting. An arm with a putter is lengthened to the calibrated Arm length and a putter is hung right above a ball. of a cup without moving the face. 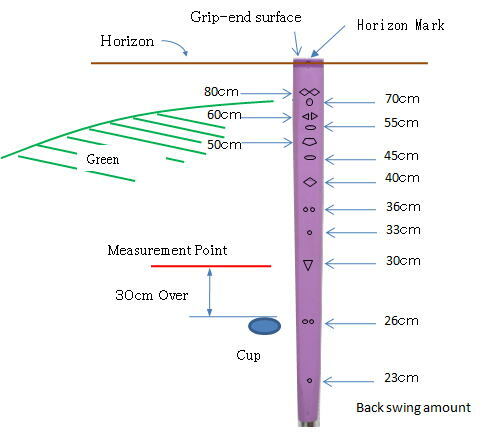 The optimal backswing amount indicated by the scale near to the cup. But the short putting needs backswing more than the direct distance to the cup. First, you look at a distant place by a standing posture and fix your head. While moving up the putter with your arm, you don't move the face except eyes. is required before a play game. 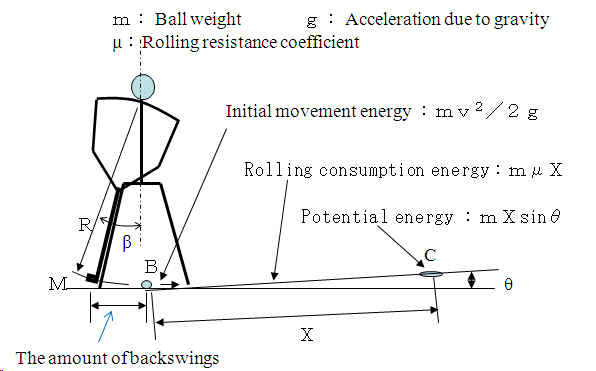 This method confirms the relation between a backswing amount and a distance which a ball rolls. (1) Choose a flat place on a trial putting green and putt a ball with backswing 30cm. position (inverse triangle mark) of the scale on the grip. carried out from the calibration. The green has many kinds of inclination. So we must compensate the measured backswing amount. The compensation rates are shown in the following table. By another method, we decide the imaginary Cup and measure the distance by DMMP like following. 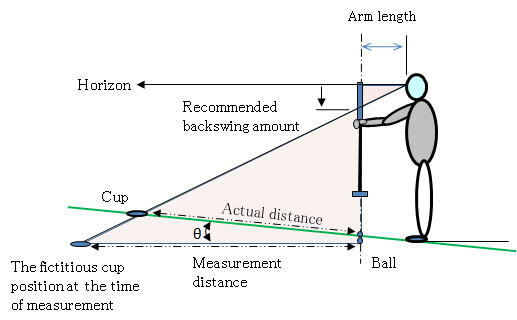 On the other hand, long putt aims at carrying a ball within 1m radius circle from a cup. 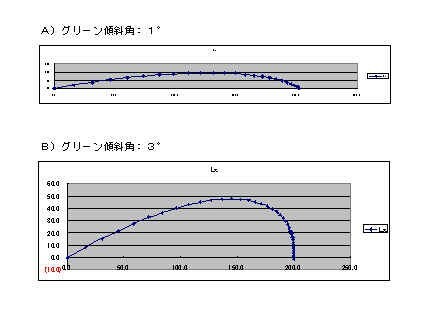 At usual swing practice before and after of the shot in 20cm, head orbit should be seen straight line. 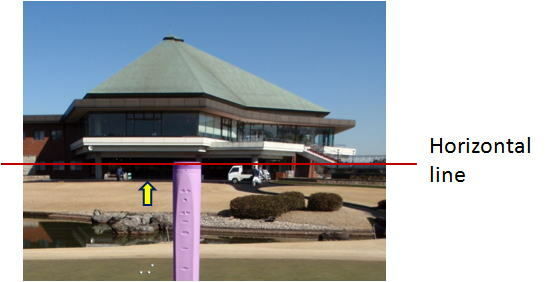 DMMP measures a distance from a ball to a cup longer on an ascent sloped green. On the other hand on a descent slope, DMMP measures the distance shorter. backswing on a gentle slope. it decreases from 20 to 50 percent on the steep down slope in accordance with a distance. Incidentally for a ball, the stable stillness becomes impossible on the slope of 3. 6〜3.7 over degree. 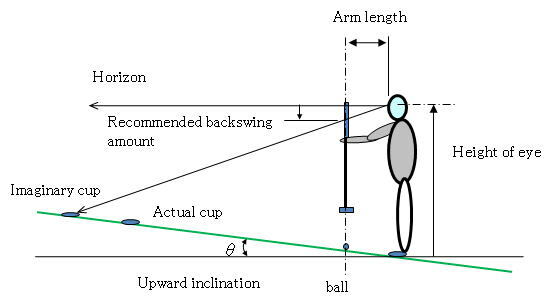 Let's know the following characteristic of a ball rolling on a slope and carry out a simulation before a putt. Cup is in the direction upper 45 degrees. Green: It is slightly quick. Cup exists in the right-angled direction (the just beside direction). Cup is in a direction lower 45 degrees. 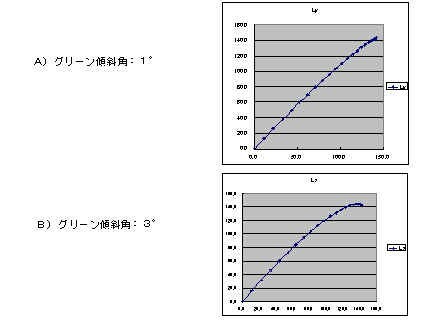 If the green speed becomes slower, the amount of curve will decrease proportionately. putting suitable distance to the cup is the minimum precondition.